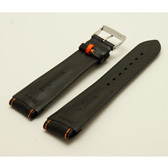 Finest Quality, hand made in Germany with a great attention to detail, this is a black calf leather sports watch strap has orange detail stitching, extra thick padding, a heavy duty look but comfortable feel. This is a specially made strap with Orange stitching. It has black leather lining and and Di Modell's patented loop anchor for extra comfort. These straps were made for Sinn watches and some have the Sinn name on the lining as you will see from the third photograph above. 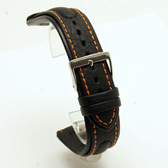 This strap will fit any watch where the distance between the lugs is 22mm. Like all of our products, it is brand new and in stock in the UK, ready for our super fast shipping. 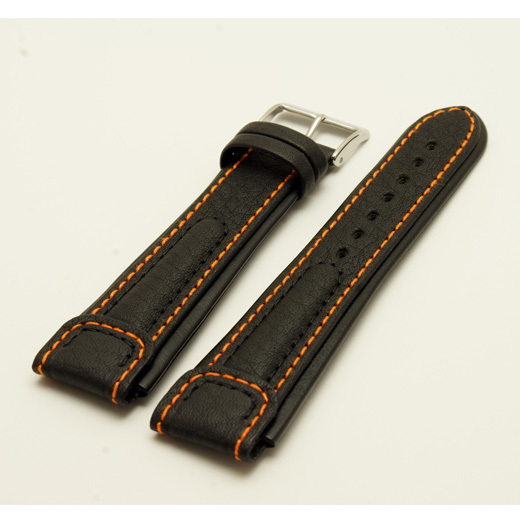 Customer feedback on this watch strap: "Top notch! "; "Great strap"; "First class strap"; "Excellent quality"; "Great strap very high quality looks fantastic on my watch"